Kristi Locatelli has been a resident of the San Lorenzo Valley her entire life. In 1992, Kristi attended Cal Poly State University in San Luis Obispo, Ca. She graduated in 1998 with a bachelor's degree in Animal Science and a minor in Agribusiness. After taking a year off to show in AQHA and NRCHA events she continued her education and received her Masters in Business Administration from Santa Clara University in 2002. Now the proud owner of Zayante Creek Equestrian Center, she has been able to put her education and show experience to work. Kristi has been riding horses since the age of 6 and began competing in Western and English events at a regional level at the age of 9. In 1989 Kristi began showing at Nor Cal and AQHA events. 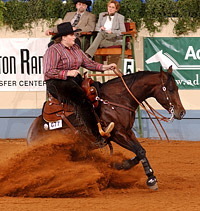 In 1992 and 1993 Kristi competed at the AJQHA World Show in Fort Worth, Texas. After a 5 year hiatus from the show pen, Kristi began showing in Reining and Working Cow Horse events in AQHA, NRCHA and NRHA.